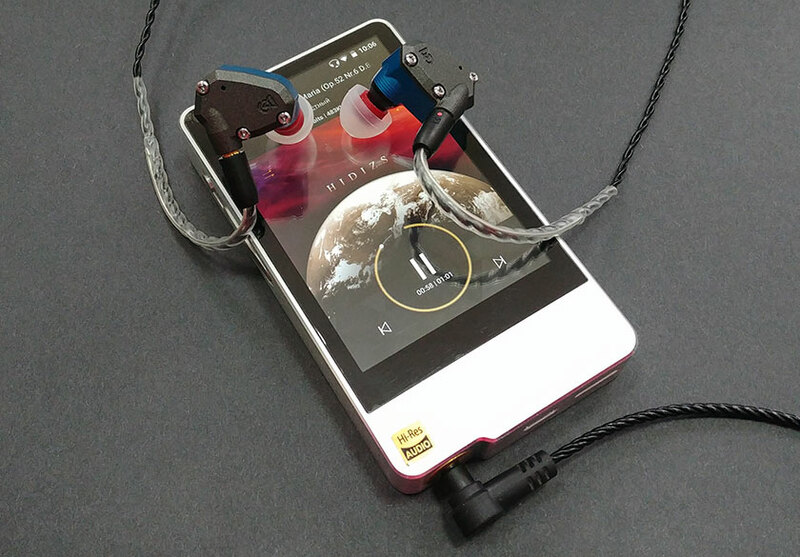 Chinese Hi-Fi audio players manufacturers (and headphones) regularly practice fund-rising for future models through crowd-funding platforms. That's what happened to the hero of today's review Hidizs AP200, which collected money at both Kickstarter and IndieGoGo. It's hard to say how there is now with the delivery to those who pre-ordered at Kickstarter, but the company claims it ships players to contributors, and the retailer already has it in stores. According to Hidizs, the player's development lasted 3 years, during this time, 120 design variants were made and 10 prototypes were produced. Let's see what happened in the end. What is interesting about Hidizs AP200? The player has two ESS ES9118C DACs for the left and right channels, each DAC is shielded with 24 karat gold. Plus, two independent quartz frequency oscillators are used to accurately reproduce audio with different sampling rates: one for DSD/44.1/88.2/176.4/352.8 kHz and the second for 48/96/192/384 kHz to reduce jitter. Of course, the AP200 supports most popular formats like Lossless: FLAC, APE, WMA, WAV, ALAC, Apple LOSSLESS, DSF, and DSDIFF, and compressed. There is hardware support for DSD 64/128, PCM up to 384kHz/32bit, ISO DSD. It's all pushed into a metal case with various back panel options and a touch screen in front. Everything is running under Android 5.1 Lollipop with all the consequences, although it's possible to switch to Pure Music mode with Hiby player only. Of course, there is Wi-Fi, Bluetooth 4.0 with the support of the aptX codec. The internal memory is from 8 GB to 64 GB depending on the version with the ability to insert a memory card up to 256 GB. Unfortunately, a balanced output is not provided. How it looks and assembled? How does the Hidizs AP200 sound? Now about the pleasant part. Let's remind, the sound is made with the pair of ESS ES9118C DACs with screening of 24 carats gilding, two independent quartz frequency oscillators and amplifier Texas Instruments TPA6120A2. It supports DSD256 and PCM up to 32 bit/384 kHz. The player was used with headphones Campfire Audio Polaris, Whizzer A15 Pro, T-Peos H-300, Sennheiser HD 215, Sony MDR-7506, Beyerdynamic T70, Oppo PM-3, AKG K550MKII. Apparently, the company tried to make the player's sound universal both in terms of headphones and musical styles. In general, it succeeded: by itself, the sound depends on the headphones, but with none of the above-mentioned models there were no peaks or dips for separate pieces of the frequency range, no too bright HF or sibilants. The player sounds musically and smoothened, with minimal care in dark shades. With an eye for the mass user. Low frequencies are very weighty, textured and massive where it's needed. Some symphonic compositions are added monumentality, especially when listening to some quality live recording. Here, LF fast, high hitting and well controlled. The middle is in its place, it is not pushed into the background, it sounds real and natural, without excessive analyticity, leaving room for the emotional filling. Both live instruments and vocals sound very tasty. The high frequencies are smoothed a little, apparently, this is done considering such class of listeners as HF-fobs. And simply, there are headphones, which are dazzling at the expense of high frequency. At the same time, one cannot say there are not enough of them or they are poorly worked out: there are exactly as many as necessary to keep the "air" in the general. The imaginary scene is very well developed in width and depth, with a very decent separation of instruments. Again, especially pleasant sensations are obtained on quality live recordings with an abundance of various instruments. The player uses a non-removable battery for 3100 mAh. The fast charging with the LG G6 charges a little over 2 hours. Based on personal experience, a full charge of the battery is enough for about 8 hours of battery life in Low Gain mode and a loudness of 70 (out of 100). Quite decent indicators for this class of devices. The three-years delayed Hidizs AP200 at the moment can be called ambiguous, although there are prospects. It will give the future owner a lot of positive emotions thanks to a very kind, driving sound without obvious whims from the point of musical styles or used headphones view, versatility for all occasions due to Android, USB DAC functions and the availability of wireless modules. Plus, the external player looks decent. At the moment, I was confused by two things in the player: the first was a strange realization of mechanical control buttons, with which I could not make friends and very sloppy software with slowdowns and lags. The player costs about 7800 UAH and it seems that it is currently the most affordable Hi-Fi player on Android, which for some users can seal the deal.